Perfectly ripe kiwi is delicious, soft and very sweet. Sometimes it’s hard to choose the right fruit. Certainly not once you bought kiwi, which turned out to be hard and sour in taste. Now you can say goodbye to this problem. We know the trick that will allow you to get to know the perfectly ripe fruit. How is it known that kiwi is ripe enough to eat? You can find out in the store, without peeling and trying the fruit. Just touch it … touch it. Kiwi should be picked up and gently squeezed. The perfect fruit should slightly bend. If the kiwi is hard, it means it must mature. It will probably be sour and not very tasty. In turn, too soft copies are already overripe. Their taste leaves a lot to be desired, it is hard to eat without getting dirty, and in addition they can even cause stomach ache. When shopping, we should avoid hard and very soft kiwifruit. Perfectly ripe kiwi tastes great when eaten alone as a snack. It also works well in cocktails, fruit salads and as an addition to desserts. It’s worth eating kiwi because it’s a treasure trove of vitamins, minerals and fiber. It provides a lot of vitamin C, a lot of vitamin A and calcium and potassium. Kiwi is one of the few non-fat sources of vitamin E. It also contains a lot of antioxidants, lutein, magnesium, zinc and folic acid. Not everyone knows, but this fruit can be eaten together with the peel, although it is not very encouraging. 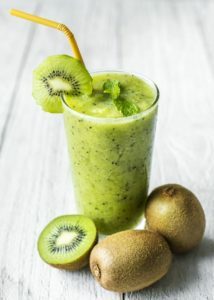 To make this delicious cocktail, peel the bananas and kiwis, remove the hearts from the apples and cut all the fruit into cubes. Put all ingredients in a blender and whisk well. Next PostNext What Is the Mediterranean Diet?